Review: Does the job in a handy format. Seems to last well and be durable. Review: This checklist is the perfect size and I really like the CheckMate brand. Two sided laminated, quality product. Review: It has all the information needed. Amazing for a 1968 model aircraft. Pros: Useful information. Laid out well. 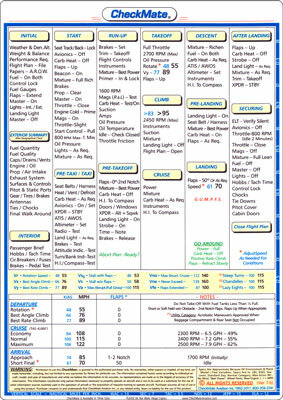 Review: I like the one page format of CheckMate's lists. There is a lot of information available at a glance. Pros: Simple, easy to use. Easy to access. Review: A very good checklist that cuts to the essentials. Review: After using a lot of differently formatted checklists in rental planes, I chose the Checkmate when I purchased my own Cherokee 180D. I like all the normal operational info on one side. And it fits nicely under the flap handle on the cable hump for quick deployment. And the lamination is well done. Cons: If only a list of this type were made a little larger. Cons: Make it slightly less reflective.